Want to create fast and small TIFF files for ArcPad? I'll show you how to convert your rasters into high performance TIFF-LZW or a TIFF-ZIP image for ArcPad 7 using a combination of ArcGIS 9.X and IrfanView. That's it, the TIFF, TIFF world and TIFF projection file are ready to use in ArcPad. ArcPad 7.1 brought some great improvements to the way that users could check out/in their data, with the ability to associate ArcPad Layer Definitions (APL's) to a new check out in ArcMap, and also the new ArcToolBox tools which can be used with other geoprocessing tools to automate a complex check out/in process. Assume you have a project where you routinely update your geodatabase with field data. You have several field workers, they each collect and return information which you put back into the central database, and each worker needs an up-to-date version of the whole database (with everyone else's edits) each time they go back out. You have created custom forms for your users to collect data, and you simply want to run a tool that provides current ArcPad files for your users each day (or week or month). This is the type of task that the geoprocessing tools are really designed for. To complete the scenario above we have built a sample ArcToolBox Model which uses the the ArcPad Check Out tool to create a fresh checkout of data (a "target" AXF), and a standalone utility (called AXFCopy) which copies layer definitions and file store entries from a "source" (or template) AXF to the "target" AXF. Please read the enclosed word document for installation, use, and customization guidance. The sample contains a Toolbox Model that produces a customized ArcPad Check Out of the Riverside data. The model uses the existing Riverside.axf sample as a template for the customization, but performs a ‘fresh’ check out of the data (called Riverside_Target.axf) from the geodatabase every time it is run. The desire to be able to print from ArcPad has been around for a while. 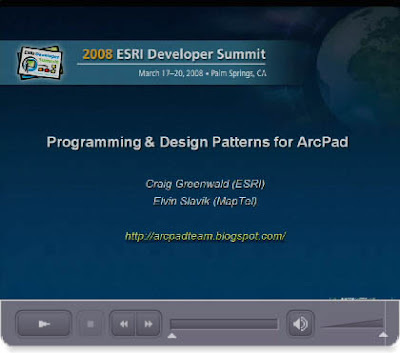 To date (and for the foreseeable future), our philosophy has been to keep the user experience between the Windows Mobile version of ArcPad and the Desktop version near identical. With the distinct lack of mobile printer drivers, adding the ability to print from ArcPad has remained outside of ArcPad's release schedule. Of course that doesn't mean that people still don't just want to print from the Desktop! Developed by Explorer Graphics, XPLprint offers users the ability to print map images direct from a desktop installation of ArcPad. The application is very simple to use and allows you print A4, letter or legal maps with a title, choice of map units, notes and your logo. The area displayed in your map window is what is used in the map. This is an excellent application for producing quick simple maps to compliment a field GIS project. 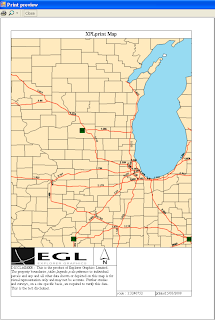 EGL acknowlege that there are some limitations in the product (eg: some complex symbolgy is represented differently on the map to that displayed in ArcPad), so i can only recommend to you to be careful to study the documentation whilst appraising the application. If you have an ArcPad innovation you'd like to share - please contact us - we'd love to hear from you!